"Смотрящий" за Вашими должниками - кто должен вам деньги?! SliQ Invoicing может помочь вам организовать и ускорить выставление счетов. Отслеживание платежей заказчиком или узнать сколько вы задолжали. Настройка напоминания. Редактирование шаблона накладной в соответствии с вашим бизнесом. Добавить графики, текст, чтобы сделать ваш счёт, уникальный для Вашего бизнеса. SliQ Invoicing includes all the essential invoicing features. Os: Windows XP, Windows Vista, Windows 7, Windows 8, 8.1 and Windows 10. The option dialog contains new options on the Invoices & Payments tab to allow new invoices to be automatically marked as paid. The options dialog allows the payment kind, e.g. cash, direct debit and supporting info to be set fo a payment to be automatically logged against a new invoice. If the option is set then any new invoice or recurring invoice will automatically be marked as paid. When a new invoice is raised the default VAT rate is set for the carriage applied for the invoice. 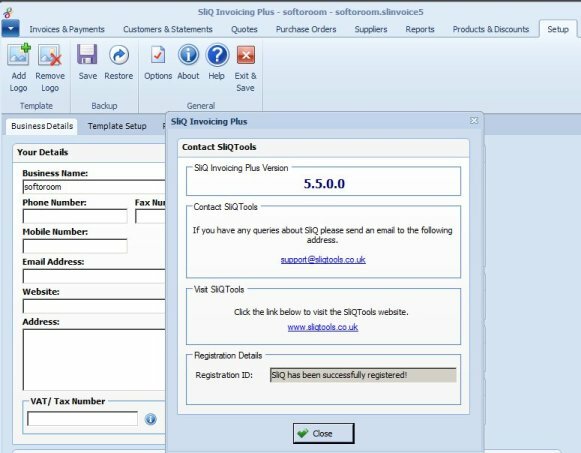 SliQ Invoicing now supports submission of VAT returns using HMRC's MTD API. You can view your VAT obligations in SliQ and choose an open obligation to submit a VAT return. SliQ calculates sales VAT from your invoices and lets you enter purchase figures before submitting the VAT return. To enable SliQ to identify sales VAT for EC/ non EC countries the country code can now be specified for a customer. Customers can now be set as Zero Rated for VAT purposes. If a customer is zero rated then no VAT amounts will be added to an invoice for the customer. The customer address and delivery address can now be added to email templates. If the number of items in stock is below the reorder level, the product is highlighted in red on the Products list. A weight can be set for a product allowing SliQ to calculate the total weight of items on an invoice. The total weight is set in the details for the product on the Products tab. The total weight of items on an invoice is shown on the Carriage/ Delivery tab when editing the invoice and can be added to invoice (and quote, credit note and PO) templates using the TotalWeight field. A new option has been added to the Options dialog on the Invoices & Payments options to maximise space when editing line items. If the option is selected then line items will be displayed in their own tab when editing invoices rather than under the customer details. Values entered into custom fields can now be stored as standard lists for easy selection/ entry in the same way that Ship Via or SalesPerson names are stored in lists. By selecting text in a line item description with the mouse and right-clicking, bold, italic or underline formats can be applied. In addition to the storing of standard Products and Discounts, Services can now be added on the Products & Discounts/ Products & Stock tab. Like products, services are available for selection when adding line items to invoices but unlike products, stock is not tracked for services. If the width of a column is adjusted, e.g. on the Invoices & Payments tab, SliQ will remember the column width after being closed and reopened. New chart reports have been added for Sales by Month and Orders by Month. Line items with a price but a quantity of zero (and hence a line item total of 0) can be added and saved onto invoices and quotes. If the invoice template is edited and line item numbers are selected then line item numbers will also be shown when editing an invoice and adding line items. Focus could sometimes be lost when typing into report filters. This is now corrected.